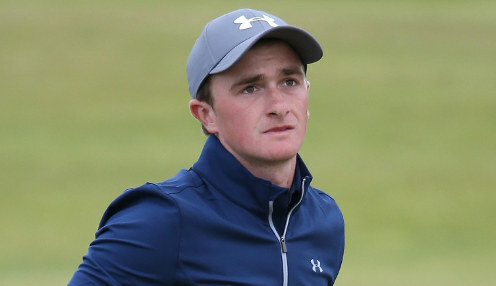 Despite believing that there is plenty of room for improvement in his game, Paul Dunne expects to hold on to his lead at the Open de Espana. The Irishman will take a one-shot lead into the final round at Centro Nacional de Golf after carding a 68 on Saturday. He is on 17-under, one shot clear of Spaniard Nacho Elvira, who posted an impressive 66 in his third round. World number four Jon Rahm, who went close to winning the Masters last week, is on 15-under alongside Henric Sturehed. They are one stroke clear of Brett Rumford and two ahead of Andy Sullivan. Dunne, who claimed his maiden title at last season's British Masters, said after his third round: "It's probably the best my swing has felt, the best my body has felt like it's been moving, but I just didn't pull the shots off. "There was a lot of grinding there on the back nine but I'm happy to get in with four-under. I probably wouldn't have taken it at the start of the day but, given the shots that I hit, I'm pretty happy with it leading into Sunday. "Everything feels good, the game feels great, I just didn't pick shots. I hit a few shots without having a shot in mind so that's something to work on for tomorrow. Hopefully I'll have a good day. I'm confident about Sunday." Dunne is 66/1 to win the tournament while Rahm can be backed at 1/500 and Elvira at 66/1.